Speaking on the eve of the competition of the South African Senior Track and Field Championships in Tshwane, 17-year-old World Youth champion, Breyton Poole is feeling very confident about his prospects for the 3rd and final Liquid Telecom Athletix Grand Prix Series Meeting in Paarl on Thursday, 22 March 2018. 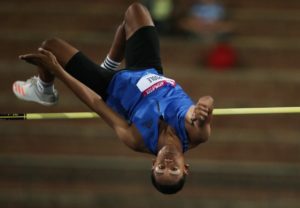 Poole opened his 2018 campaign at the inaugural Liquid Telecom Athletix Grand Prix Series Meeting in Ruimsig on 01 March with a height of 2.15m. South Africans have gotten used to seeing him jump over 2.20m and were a bit disappointed, but the youngster was quite happy. Poole jumped a new Personal Best of 2.24m to win gold. In November of 2017 at a League Meeting in Western Cape he bettered that to 2.25m.